I had something else planned to show off for this time, but because the weather is way too hot at the moment and a friend told me about his vacation recently, I’ve been in something of a holiday mood. So I went shopping in the auction house, got some pretty clothes for higher temperatures and went out to find a nice place to cool off a bit. Behold – the Fabulous Summer Outfit! Elegant Robes: One of the most fancy dresses in the game in my opinion, along with the differently coloured ones of the same model, like the Mooncloth Robe. I like how the colour of the neck part matches with the frame of the glasses, so I picked this up for another high amount of gold on the auction house. Could have been way cheaper if I was patient, but I wanted it right now so I paid the price. Oh well, that’s what I earn my money for with tailoring! 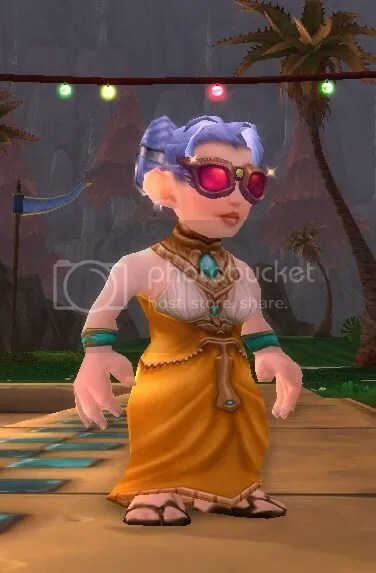 I guess there are a lot of other nice robes this could work well with, like the Robes of Insight (again rather expensive; these would be even better for hot weather, but the really revealing stuff always looks a little awkward on gnomes). Knitted Sandals: The easiest and cheapest part to get by far since they can be bought in a lot of main cities of both factions, and a must have for lots of nice combinations with robes and dresses that don’t fit well with heavy boots or other kinds of footgear. There is also a green version of this item for transmogrification as reward from The Kurken’s Hide, the end of a quest chain on the Azuremyst Isle , but sadly for alliance only. This entry was posted on Monday, July 22nd, 2013 at 19:09	and tagged with Rhinestone Sunglasses, Shopping, world of warcraft, WoW and posted in Armor Sets, World of Warcraft. You can follow any responses to this entry through the RSS 2.0 feed.